A wooden deck is one of the most beautiful components you can add to the exterior of your home. A deck makes a wonderful gathering space where you will enjoy spending time with family and friends. One thing you need to know about owning a wooden deck is that you have to give it annual maintenance. Here is a look at how you can take care of you deck with proper deck cleaning and staining each year. The best time to inspect your deck each year is when spring rolls around. Winter can be very hard on your deck, which makes spring the perfect time to make sure it is undamaged. Things you should look for in particular are loose boards, protruding nails and wood rot. You will need to make repairs if you notice any of these, but you can proceed to cleaning and staining your deck if you find it undamaged. The best way to clean your deck is to use a pressure washer. The force of the stream that is released from a pressure washer will completely remove any dirt or grime that has built up on the surface of your deck over the year. Use a sweeping, back-and-forth motion with the pressure washer. Take your time during this process to make sure you thoroughly clean every inch of the deck. Once you have cleaned the deck, let it completely dry and inspect it. If it appears to be spotless, you can move on to staining the deck. If you don’t have access to a pressure washer, you can use a cleaning solution and a stiff brush to clean your deck. This will take much longer than pressure washing your deck, but you should be able to get your deck just as clean with the power of elbow grease. 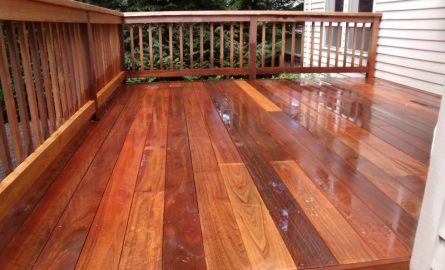 The reason you need to stain your deck annually is to give it protection. Wood will rot if it is left untreated, and it will rot especially quickly if you live somewhere with fierce winters. Staining your deck seals it off from the elements and keep moisture from harming the wood. Sealant is toxic. Make sure that you cover up any nearby plants before you begin sealing your deck. You also need to keep children and pets away while you are working. The deck needs to be completely dry before you being sealing it. Any moisture left on the deck will get trapped inside the wood and lead to rotting. Use an oil-based sealant rather than a water-based sealant. The oil-based sealants give superior protection and are longer-lasting. Once you have finished sealing your deck, let it dry completely before anyone uses it. Your deck will now be protected from the elements for another year.